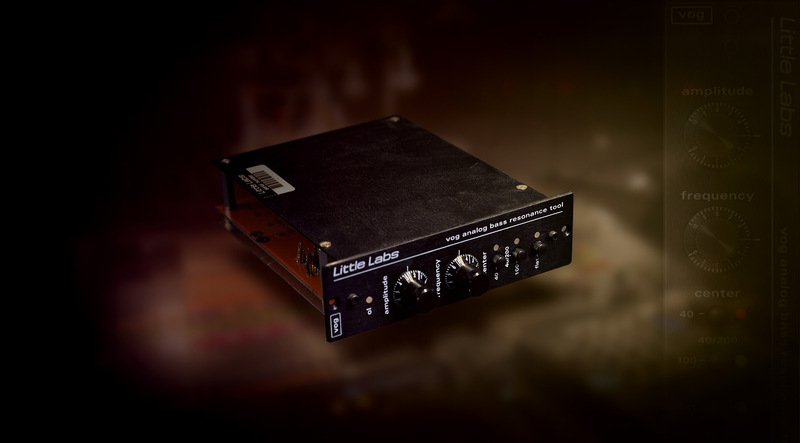 For many top mix engineers, the Little Labs Voice Of God is the ultimate bass resonance tool. This unique 500 series module allows you to intuitively shape the all-important low frequencies of your mix, as well as add depth and “oomph” to vocals and other sources. Authenticated by Little Labs, the Voice Of God Bass Resonance plug-in for UAD-2 hardware and Apollo interfaces perfectly models this unique processor, making it a go-to tool in the hands of multi-Platinum mixers like Joe Zook (Katy Perry, The Hives) and Joe Chiccarelli (Beck, The Killers). Little Labs has a knack for creating problem-solving tools for the studio that perform equally well as creative ones. Upon its introduction in 2009, owners of the hardware VOG quickly realized multiple units are a must have — one for bass, kick drum, toms, low frequency percussion, and especially vocals. Fortunately, with the UAD Little Labs VOG plug-in, customers can have as many instances as they need to make “the low end” come to life. With just two knobs, you can dial in the VOG’s desired frequency and effect amplitude. The center of the sweepable frequency range is selected via two push-buttons of 40 Hz and 100 Hz, or you can set the center to 200 Hz by pressing both buttons simultaneously. Everything below the targeted frequency peak is rolled off in a smooth curve — up to –24 dB per octave — ensuring tight low end, while the frequencies above remain intact. The VOG plug-in is perfect for mixing, mastering, post-production sweetening, sound design, and audio restoration. Use it to easily simulate proximity effect for adding chest resonance and “heft” to vocals. Simple adjustments can yield enormous sounding drums, or completely transform the tonal characteristics of an electric bass. The VOG’s flexibility makes it the right choice on a wide range of musical sources and it’s the perfect way to tune the low end of any mix for incredible detail and punch. In this video, learn how to use the UAD Little Labs Voice Of God plug-in to enhance an 808 bass part as well as beef up a thin-sounding kick drum track. Plug in of the Gods! Fantastic for getting quick results on kick and bass; VOG really brings out the lower register without sounding floppy or loose. Great for subtle enhancements, even better for creative abuse. I had a feeling that this "less glamorous" plug in would knock my socks off. I was right! If you're like me and sometimes struggle with getting the right blend of bottom end in your mixes, this is your ticket. Thank you Little Labs, thank you UA for this gem. This plug in kicks @$$! ...this would be it! I can't even begin to describe how intuitive and fun it was to use this plugin. Technically speaking it does everything it boasts and more. I was able to find the head voice of a male actor in a webseries I'm working on as the re-recording mixer and I was so upset that I didn't find out about this awesome tool before the pilot episode was released. Don't be fooled by the seemingly simple look of this tool as simplicity sometimes can make for a better understanding of what you're trying to achieve sonically. You need this plug in, if you do anything that involves vocals. One of my most used plugs, this is certainly very useful. I initially found the way to adjust the settings on this is kind of unintuitive, as the whole turning the wheel-kinda-experience is quite fiddly. It needs a little getting used to, as does using the buttons to determine the center-frequency. this one is really able to rescue a thin bassdrum or snare! really easy to handle and effective on anything needing more power in the low mids or bass! i often double the bass-drum track, dropping in some 40hz with the VOG..... it only takes you a few clicks to get that super-thick subkick-sound out of almost any track! The bottom end has always been the hardest thing for me to mix... this plugin really makes me focus more on it.... there is a whole universe down there....and this is my favorite telescope to date! I was actually a bit surprised by the change and the quality of sound. Basically, it's a one band eq, but the richness of sound was astonishing to me. As a bass player, I'm always looking for ways to make my recorded bass sound better. This is definitely a great tool for my arsenal. It could also be done with a good parametric EQ (the UAD Cambridge comes to mind because it can be so surgical) but the VOG is so wonderfully simple, effective and most importantly great sounding that it's quickly becoming a favorite to add oomph! This is like the bass frequency army knife, sure you could come close tweeking for hours with an eq to get a similar result, but this plugin gets right to the point. And it does it extremly effectively. I was surprissed on the use I get out of this on vocals as well. One of the best plugins I've purchased so far. GET it!!! 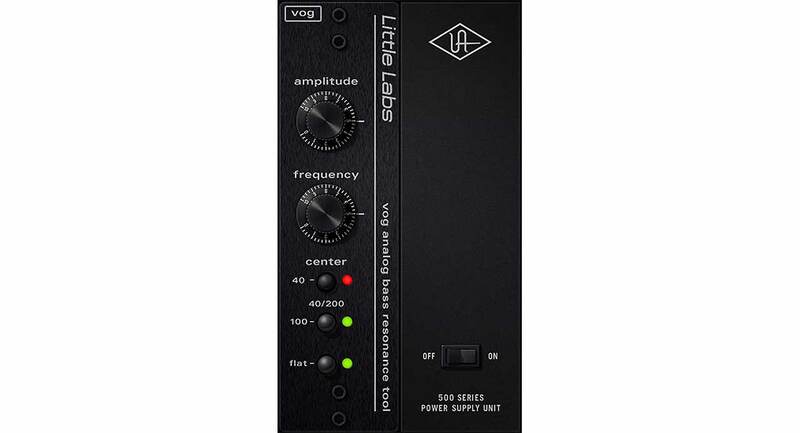 Little Labs® Voice Of God Bass Resonance Tool is a true low-over head kind of tool for the bass sound. I'm glad to have this plug-in for bass track. It is excellent engineering concept to dig in the mix to get the sound I want for the bass line. Thanks to its creator. I can't tell you how much I LOVE this. I'm a voice over artist with a deep, resonant baritone voice and the VOG puts the spotlight on what defines me the most. The genius of this unit is that it doesn't create anything that isn't already there. It allows you to put a microscope to those target frequencies and gently highlights them without hype. This is the real deal! Exactly as advertised by UA, a "magnifying glass" for everything in the low end family that resides in your mix. Fatten it up or get it just right without affecting any frequencies you may not want to be affected in any way. Two Thumbs up, could not live without this now that I own this handy little tool. It's just awesome!! I can believe how musical it is!! I love it over my kick drums !! You can't go wrong with it!! Very cool! Does a great job cleaning up the bass in amateur / poor quality home recordings that are brought to us for mastering. sick! getting amazing results with this for mixing deep house and techno. solid for getting the bottom end on kicks and bass lines to rock the club PA, the right way and without the "mud". love it!! VOG has become my final plug on the vocal buss on just about everything. It''s subtle warmth really adds body to any vocal track. Also great for other soloing instruments. Using it on a movie for dialog. WOW. My dialog sounds better, with less processing. The VOG is awesome! Able to reach into a drum track that we used a drum machine on. I was able to fatten the bottom end of the track and give it some tone shaping beyond the capability of EQ. It is a wonderful tool, glad I own it.